Home > Advertising & Promotion > Should I Offer Evening Meals at My B&B? As today's bed and breakfast customers in the United Kingdom expect more than the stereotypical seaside boarding house of the 1960s, the dividing line between a B&B, a guest house, a pub and a hotel is getting distinctly blurred. An increasing number of B&B's are offering evening meals and in this article we'll investigate what this means and whether or not it's a route that's worth going down for your B&B. The first step is to consider what evening meals you could offer. 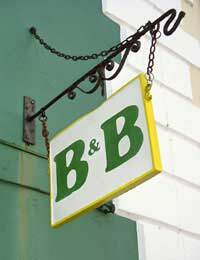 One B&B offers evening meals for people who have dietary considerations that aren't easily catered for in their town but are relatively easy to cook from raw ingredients. This is a service that they offer as a bonus and allows them to advertise in vegan and health food magazines. The choice is limited though, effectively they cook one meal and there is no choice. Customers accept this as they know that the kitchen is not a commercial one and there are no chefs, the B&B is a classic example of a business being run by a couple. To offer more choice it's necessary to invest in commercial cooking training and a higher standard of kitchen equipment. This also means entering the world of hygiene regulations to a far greater extent than a B&B offering just breakfast. This cannot really be a successful investment for most B&B's. The costs would almost certainly be outweighed by the returns and the potential waste of offering, say, three evening meal choices in an establishment with only four double rooms would only make matters worse. But in some cases an evening meal is a must. Many bed and breakfast establishments are so isolated that there is no other option, apart from a ten or twenty mile drive, particularly during the off season. But establishments in those circumstances know that guests are seeking that isolation and will put up with a limited choice of evening meal. These places will be used to the situation and will explain it to customers well before their arrival, making it plain that they should either stop for something to eat en route or arrange to eat at the B&B. If the guests choose the latter then the owners will already know what meal options they can offer for that day and will give the guests those options so that they can decide when booking. This way the B&B owners know what they will be cooking and can get the meal ready on advance. If you decide not to offer an evening meal you should make efforts to ensure that your customers have a variety of places to choose from nearby. Make sure you have a printed list of all the eating places that are easy to reach, from takeaways to restaurants. It should also give opening times and days when they might be closed, and those should be checked frequently. You should also consider opening the dining room to those customers who choose to eat takeaways. If you don’t the chances are that customers will take their takeaways to their room and then you'll have the problem of the smell and the cartons to dispose of. It's much better to work with people who are going to eat takeaways than alienate them. After all, if you're not offering any alternative you can hardly complain and they may become your best customers in the future. Your local council should be able to direct you to any locally available business start-up help. @albarmarina- lots of the information on this website will be of use, but of course some rules and regulations in Ireland may be different. We cannot find anything specifically about starting a B&B in Galway but there is some really useful business support information on this page of the Galway County Council website. Hi John. Lots of information on this site! Was there something specific you were interested in?